So, my blue slate pair: she started laying about 3 weeks ago, in a provided dogloo with straw. the ducks also layed there, but since those were infertile (drake got eaten by an eagle), I removed them. the hen was a bit lazy at first, only staying in the nest about half the day. After about 2-4 days of that, she’s been sitting on them most of the day, and I think all night. today is about day 9 of her sitting more often. I was able to count 9 eggs total, during a recent outing of hers.
? : is this spotty sitting problematic? I was thinking of waiting about 30 days total, and if there’s no activity, removing all the eggs, and hoping she’ll lay another clutch.
? : if any hatch, can she be trusted to care for the chicks, or should i remove them to a brooder ASAP? Since they were layed over a nine day period (at least), will they hatch over the same period, or will they hatch together?
? :can the poults eat medicated chick feed? or is there a more appropriate feed? I’ve had some experiences that might be helpful. You get to decide how it would apply to chickens, since I’ve worked mostly with geese & ducks over the past 5 years. Not recommended for geese—chickens may do better though. 3 years ago I used a plastic dog house with plenty of straw as a nest shelter for a pair of ebden geese in our back yard. It was quick & convenient, which are both strong positives in my book. The ~6 eggs did not hatch however, even though the goose was a relatively good sitter. On inspection, I could tell that the eggs were fertile, but did not progress past about the 10-day stage. There were at least 2 issues here. The main one was the goose had to sit on a flat surface instead of a cupped nest. This allowed the eggs to scoot out from under the mom every once in a while and they got chilled. The 2nd is goose eggs need the humidity from the ground to progress & hatch, and they didn’t get that either. A 3rd potential problem is that late-stage gosling eggs need abundant fresh air during their last week of incubation to finish out, and that might have become an issue with the plastic floor. With that said, we did have a broody chicken hatch out a gosling in a plywood box with straw, but it was only sitting on 3 eggs in a small (12”x8”) space. This doesn’t seem to be a killer as long as it only happens during the first week. I’ve been concerned about this with a couple of our geese, but they were became much more disciplined after the first 5 days or so, and had successful hatches. It is normal for geese to take a 10 minute break twice a day for food & water—it’s amazing to see their consistent timing. I’ve candled the eggs at night with a flashlight and removed infertile or dead ones after day 7—that’s when you can see the blood vessels well enough to make a decision. It’s encouraging to see them grow, and the mom doesn’t mind. I don’t do this now because the gander is always on guard. I love an aggressive gander on patrol, but it prevents me from checking the nest like this. When the eggs hatch both ducks & geese have behaved similarly. They continue to sit for another day or two, but take progressively longer outings. It’s important to put water for the chicks near the nest. I also like to put feed nearby for them to find it to help ensure survival. The babies will do best with mom, and she will keep them warm as needed. We have had problems with independently minded chicks straying off on their own and disappearing due to crows, raccoons & owls. This is a challenge since the chicks can fit through fences that adult birds can’t. 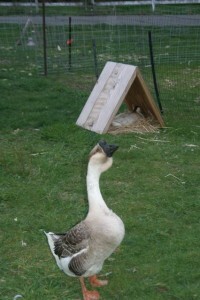 For goslings, the gander guards them by day, and the goose shelters them at night and during rain. Drakes don’t seem to do much at all with the little ones—it all falls to mama duck for watching over ducklings. I had one chicken hatch a gosling 4 years ago. She was the best protector that gosling could have asked for. She even kept me away from it! When the eggs are cold, they do not progress. Thus, when the broody mom starts to sit, all the eggs are at the same embryonic stage, and so they all progress at the same time. This means that they will all hatch at the same time—usually the same day. It’s a joy to hear the eggs calling through the shell on the day before they hatch! Since I do waterfowl, I can’t do medicated feed. My impression is that medicated feed is to prevent bacterial infection outbreaks in large populations of caged & contained chicks. I’m doing free range birds, and emphasize healthy diets on healthy pasture. My opinion is that your birds will do better with a non-medicated ration & access to grass. The best results I’ve had was when I put out worm filled compost daily for the chicks & ducklings to pick through. Because chickens scratch, they do much better at this routine. I’ve successfully put a “working chicken” in my duck pens to turn the compost for them. I’ve had sitting birds taken by raccoons, which is why I’ve gone with guard ganders. It worked last year on an experiment with one goose pair & one duck pair, so I’ve expanded it to 8 pens now. Last year’s rooster was causing problems for my 4 year old who was responsible to feed the hens, so it went into the stew. We had the incubator running, so I continued to put the chicken eggs in to see how late they would hatch. I had eggs hatch that were laid 30 days after the rooster was gone! My reason for doing natural nesting is to have the animals do the work instead of me. It’s great fun to do a little bit of planning and then let nature run the way God designed it to go! This entry was posted in Chickens, Ducks, Farming, Geese. Bookmark the permalink.